B.F. Skinner is the father of the Borderlands franchise and he doesn’t even know it, mainly because he’s been dead for years. We all learned about B.F Skinner is psych class at some point in our lives, but in case you were too black-out drunk that day to make it to class, I’ll tell you that B.F. Skinner was all about what he called operant conditioning. In simple terms, he figured out that he could modify a person’s voluntary behavior through positive or negative reinforcement. Based on that, the original Borderlands might as well have been one of his experiments. The act of opening treasure chests, turning in quests, and simply shooting bad guys offered such positive reinforcement, through clicks and whirs, the “cha-ching” of a cash register, and the cascade of colored numbers and words, that many of us simply could not stop playing it. There was always one more treasure chest to open, one more quest to finish, and one more enemy to kill. Those associated sounds and visuals no doubt made many a gamer’s heart race. 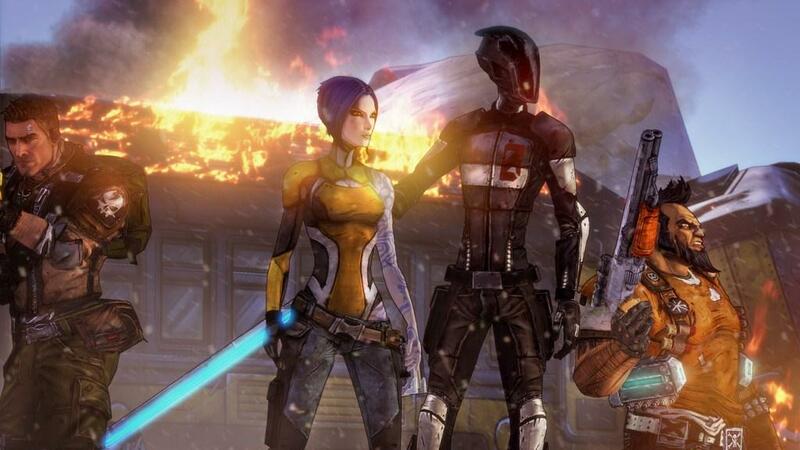 The returning cast of characters is probably the most pleasantly surprising part of Borderlands 2. I won’t go into specifics because when it comes to the religion of No Spoilers, I’m devout. Trust me when I say that your favorite character from the original, whoever that is, likely returns in one way or another. Even better is that this time, they’re fully animated, fully voiced, and they interact with you and each other. No longer do you accept and turn in quests to card-board cutouts that repeat the same humorous quip over and over again. Well, maybe some of the 2nd tier characters remain just the same as they appeared in the first game, but that’s often part of their charm; however, that is more than balanced out by the elevation of the game’s main characters (besides the player-controlled character, of course) to fully-realized status. No longer are they ciphers, but rather, they’re real characters that do more than simply talk to you. That adds much-needed weight to the story of Handsome Jack and his Hyperion forces, their tyrannical rule of Pandora, and the new crew of vault hunters determined to stop him that makes up the bulk of Borderlands 2’s much stronger plot. And plot was really the only area where the original Borderlands failed. I don’t want to give the impression that Borderlands 2 is a carbon copy of the original because, despite all that remains the same, new bells and whistles abound. Most importantly, because it’s the real reason anyone is playing Borderlands 2, is that the guns have received a much deserved upgrade in both features and appearances. I won’t speculate on how many more bazillion guns there are than in the first one. I’d have to play them both for years counting every gun I find to be able to tell you whether or not Gearbox was being truthful when they said Borderlands 2 has a “bazillioner” more weapons. No matter how many different weapons are actually in the game, I feel confident saying that when you play Borderlands 2, you won’t be saying anything like “there aren’t enough guns.” Just like in the first one, there are a bazillion and let’s leave it at that. Of course, it’s not only about simple numbers; they have to look cool as well. Borderlands 2 doesn’t disappoint there either. Firstly, all the guns have received a graphical makeover (even though the rest of the game looks the same as the original Borderlands). Let’s face it; many of the guns in the original were down right fugly. 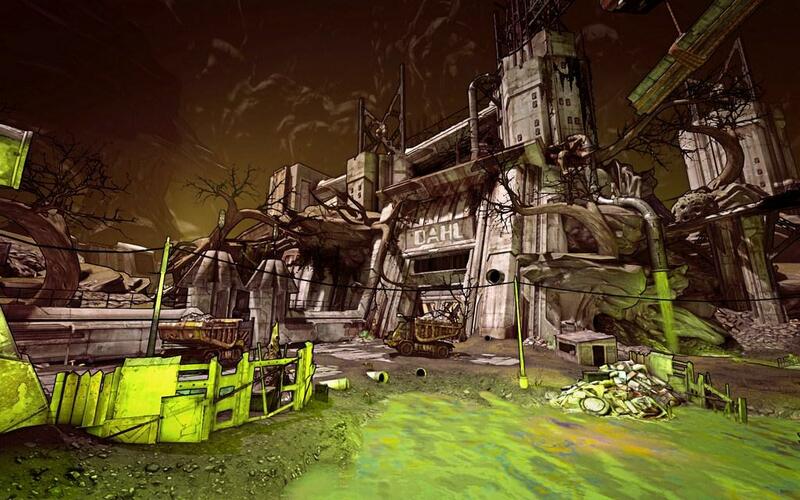 They were skinned in muddy textures and many suffered from rather uninspired design, but Borderlands 2 largely fixes that. The guns look sharp, so sharp, in fact, that Gearbox felt it was okay to provide a 3D viewer players can use to examine every weapon and item in the game with the ability to zoom in, and fully rotate in both axes. Not only are they skinned in better, more colorful textures, (many sport nice digital camo patterns or even flame or shark teeth decals) but they generally just look cleaner and more interesting. Submachine guns especially benefit from this upgrade. I thought the SMGs in the original really suffered the most from muddy textures and ugly design. 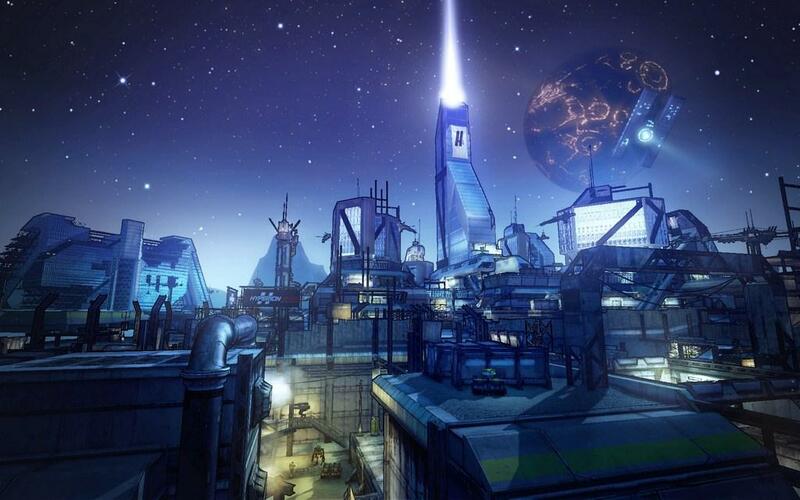 In Borderlands 2, however, they’re probably the best looking guns in the game with their graceful and futuristic curves or hard angular militarism. Like I said before, you aren’t limited to just looking at guns in the 3D viewer either; you can look at any item whether it’s a shield, a grenade mod, a class mod, or something else. They don’t look as sharp as the guns and often suffer from the same muddy textures as the last game, but there’s no real reason to look at them other than sheer novelty so I’ll let it go. Another reason to let that one small failing go is that now all those items appear fully rendered on your character which you can see whenever you open up your inventory or on the title screen. Textural vagaries aside, overall, everything looks really cool. That’s not always enough, however. 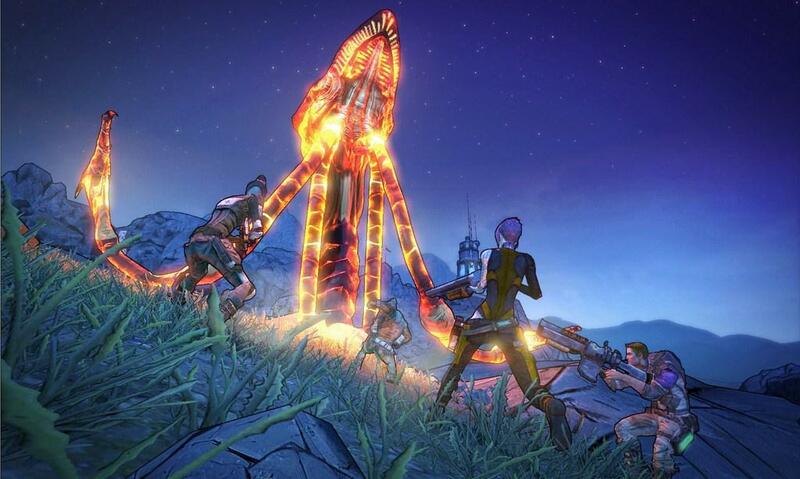 Along with looking cool, the weapons and items need to function spectacularly as well, and they do in Borderlands 2. Many of the functions of the weapons and items are pulled directly from the first game, but never fear, Gearbox has added a slew of new features and functions. For example, there is a new elemental effect guns can carry (accompanied by a new hazardous explosive barrel) called “slag.” I don’t know what slag is, but I know what it does: slag reduces an enemy’s damage resistance. A critical hit against a slagged enemy will do a staggering amount of damage. The other really cool weapon function is something Gearbox told us about early on, and that’s how Tediore now makes disposable guns you throw away when empty to explode like a grenade while a new fully-loaded gun is flash-forged in your hand via space magic. It’s not amazingly useful, but it fits with the game’s fairly absurd tone. New shield and grenade functions include reflected damage, and bullet absorption (among others) for shields along with a new singularity grenade and fuses of varying lengths (also among others). Class mods also make a return, but they’re largely unchanged. Artifacts are back as well, but instead of imbuing your action skill with an elemental effect, they now provide a specific upgrade to one area of your character like health or vehicle boost capacity. The action skills operate in the same fashion as before, although there are slightly more “branches” per skill tree. Honestly, I would have liked to see something different with the skill trees beyond a few more arguably useful skills because early on it’s so hard to see any real improvements. The initial branches of each skill tree only offer marginal improvements to basic aspects like reload speed or damage so it’s several hours before you start to see any real growth in your character. This time around, however, there is a brand new way to grow your character. Do you remember the challenges from the original? They were in the last tab of your inventory screen and they acted as a creative way to track highly detailed in-game statistics. To me that was one of the most original ideas in the first game, and it returns in the second with a much bigger role. This time around, instead of simply recording stats and dishing out XP when challenges are met, challenges now affect your “badass rank” which goes up for every challenge you complete. Also when you go up one badass rank you get a token that can be redeemed for a permanent stat-boost. You can improve everything from health to gun damage, elemental chance, shield recharge rate, or any similar stat. The boosts you receive are small, never more than a 1% improvement, but they start to add up as you continue to play. However, like the action skill trees, you need to put in several hours before you see any real results. And don’t worry about making yourself overpowered too early because you can turn them all off with the touch of a button at any time. 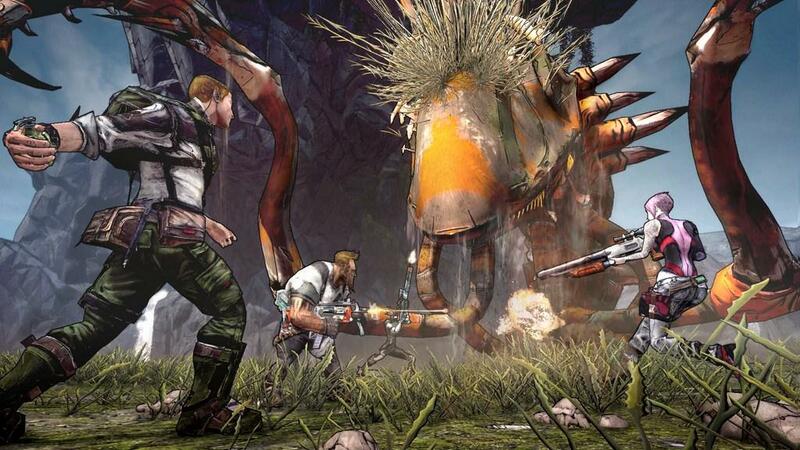 Gearbox really has managed to make one of the most original features of the first game even more original. One other brand new feature that doesn’t have any analog from the first game is a new currency you earn and find alongside regular cash. It’s called Eridium and it’s used to purchase black market items. It’s fairly rare and the black market items seem mostly limited to storage deck upgrades, so in a way, Eridium replaces those “fix the claptrap” missions from the first one that rewarded you with SDUs. 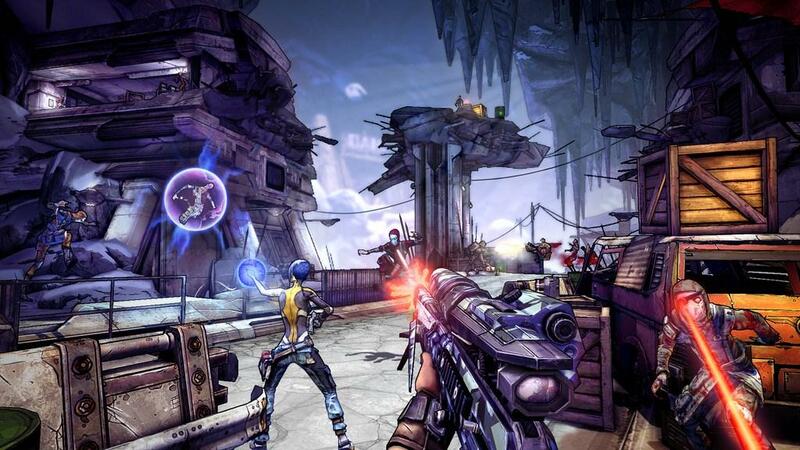 Naturally, Borderlands popular four-player online co-op makes a return along with its offline split screen counterpart. Gearbox deserves a real pat on the back for going the extra mile by keeping couch co-op as part of the game while other franchises seem to want to ditch it at the first opportunity like it’s an annoying broheim covered in vomit. Duels return as well, along with a new trading feature that hopefully will go a long way toward reducing the number of loot ninjas out there. I didn’t spend much time playing co-op, but I didn’t really need to. It’s just like the single-player portion but with up to four players and harder enemies. Again, just like in the first game. Despite all the awesomeness I’ve spent the last 1,500+ words telling you about, there are a few issues that I should bring up lest I be accused of some sort of impropriety. The biggest one is that there is constant texture fade-in. If you’re the kind of gamer that demands technical perfection despite wearing the same Cheetos-dust covered sweat pants for weeks at a time, then you should take note of this issue and prepare your rage-note cards accordingly. In all seriousness though, I didn’t find it to be much of a problem mainly because the texture fade-in is constant and even. What I mean is that it occurs at the same times in the same places and the rate of the fade-in is always the same and there aren’t any extended periods where it’s like the game forgot to perform the final texture pass. It comes off as part of the game (and it is, since that how the Unreal engine that powers Borderlands 2 works) rather than a flaw borne from bad, lazy, careless, or underpaid developers. The other minor issue is that there is a bit of slowdown here and there, but believe me when I tell you that I only ever experienced it during times of extreme extremeness. I’m talking about a second of slowdown during situations like sprinting and reloading at the same time while I was on fire and surrounded by exploding robots that were also on fire. Normal combat never produced any slowdown for me. And I really feel like neither the texture fade-in nor the slowdown was indicative of a lack of quality control or that Borderlands 2 suffered because they exist. 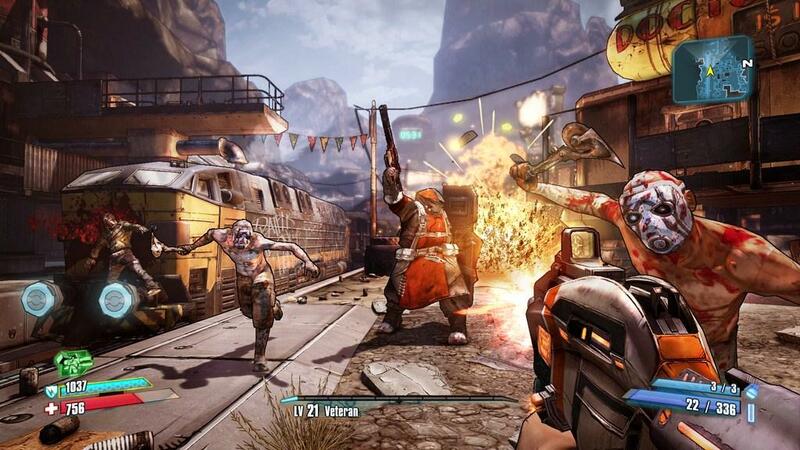 No, the truth is that Borderlands 2 doesn’t suffer from much of anything at all. 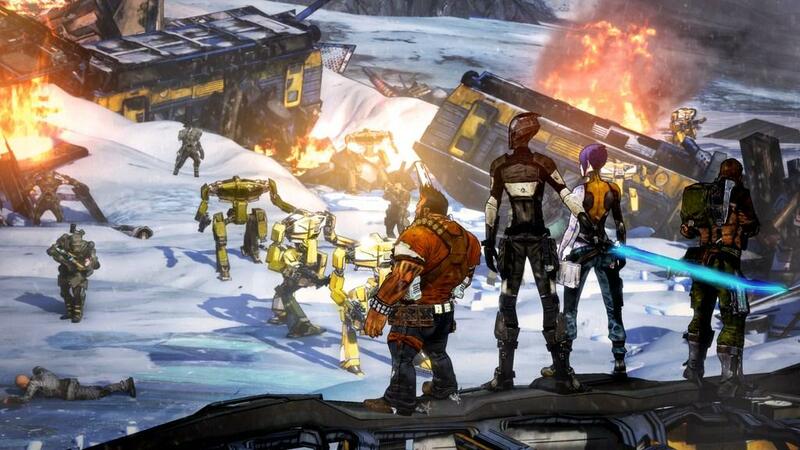 Gearbox made one of the most original first person shooters ever when it made the original, and while Borderlands 2 may be less original by virtue of its nature as a sequel, it’s still a welcome relief from the wide world of gritty realistic military shooters, and gritty unrealistic space marine shooters. Indeed, Borderlands 2 is the Adult Swim of shooters compared to the HBO that is Halo, Call of Duty, and Battlefield. Borderlands 2 takes the franchises’s successful formula of tons of guns and absurd humor combined with enough bells and whistles to make you drool like a dog at feeding time and simply updates it instead of changing it completely. That’s okay by me when what’s there didn’t need to be changed and the handful of things that could benefit from an update, got one. It’s definitely one of the best shooters of the year.